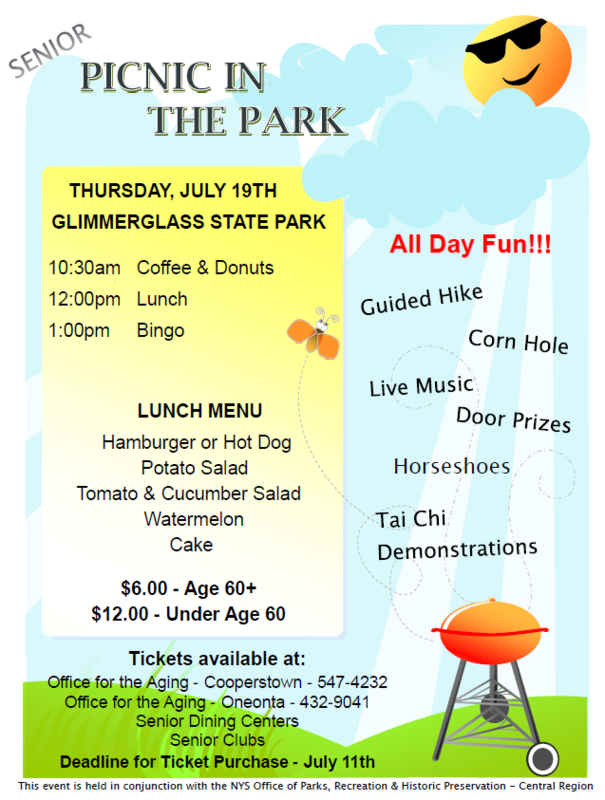 our upcoming Senior Picnic held at Glimmerglass State Park on Thursday, July 19th, beginning at 10:30am. We have a lot of great activities planned including horseshoes, Bingo, corn hole, live music, Tai Chi demonstrations and a guided gentle hike by Otsego County Conservation Association. We would be grateful if you could share this information with your community and networks. Tickets are available at the Office for the Aging (Oneonta and Cooperstown), any of the 7 senior dining sites, or through the various Senior Clubs throughout the County. Tickets must be purchased by July 11th and are $6.00 for those age 60 and older and $12.00 for guests under 60.